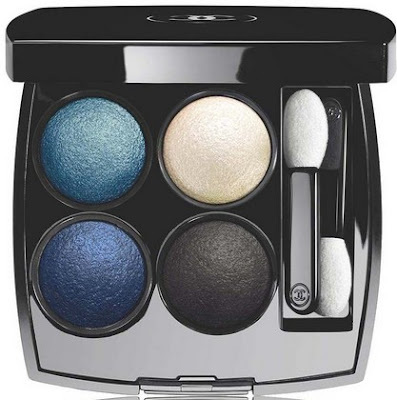 Inspired by sultry jazz, this spirited makeup collection celebrates the boldness of blue. In the spotlight: a new plumping gloss for high-shine lips and daring eye shades to turn up the drama. Designed to be worn alone or over black mascara, this bright, turquoise top coat adds a shimmering finish to any eye look. A translucent, high-shine gloss that visibly plumps lips while enhancing their natural colour. The cooling formula features emollient oils to soften and hydrate, and Vitamin E for antioxidant protection. The invisible gloss that makes them even more visible lips thanks to its translucent texture dressed in a crystal bottle. The makeup result: a shimmering gloss on luscious lips, visually smooth and hydrated. VOLUME GLOSS enhances the natural color of the lips and distributes exquisite hot-cold sensation. I swatched the eyeshadows from left to right and then followed next was the bottom row which was swatched from left to right as well. 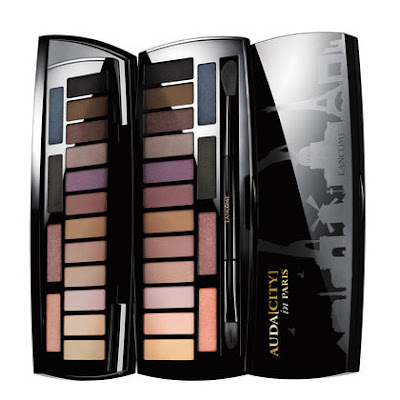 Also, as I mentioned in a previous post I just happened across the Auda[City] Lancome eyeshadow palette quite by accident. 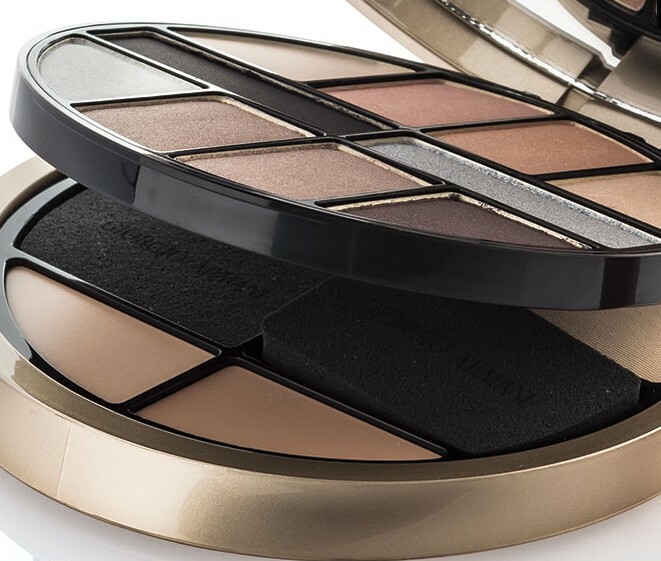 I was placing an online order for something else on the Lancome website when I saw a pic of this palette. I was like, "that is a really nice palette" and once I read it was "designed by Lisa Eldridge", I was like "sold - THAT PALETTE WILL BE MINE"! I know, I know, this year has been THE YEAR of the palettes! YSL, Urban Decay, Dior just to name a few, all have released rather large palettes. So the question I keep getting is - Do I really NEED this palette? YES!!! Yes, you really do NEED this palette. I LOVE all the colors included in this palette. It's as if someone read my mind and built this palette based on all of my favorite eyeshadow colors. The most perfect combination of light and dark shadows which will allow me to create the perfect daytime or nighttime look. With this palette there's no need to haul around several different palettes. OMG, I LOVE IT! 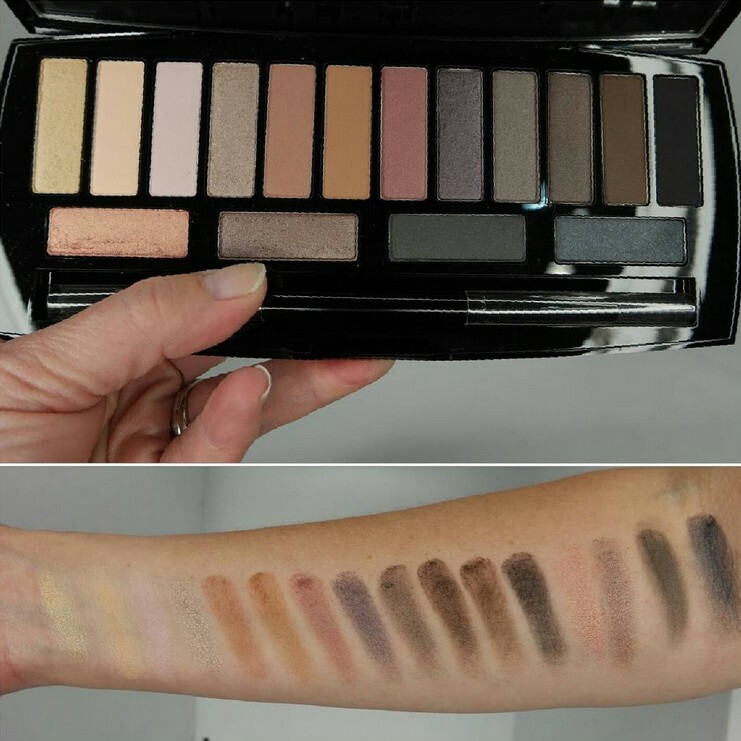 The shadows in the palette are extremely pigmented and blend so easily. They are soft to the touch but not so soft that they will crease, crumble or have any crazy fallout. In that respect they have a kind of dry texture. When you first use the shadows all you really need to do is lightly tap, tap, tap your eyeshadow brush into the shadow to pick up a good bit of product. Then you will lightly tap, tap, tap the eyeshadow onto your lid or crease. These are super pigmented eyeshadows so it doesn't take much to really overdo it. I know I did the first time I tried using the palette and ended up with a muddled mess on my eyes. So I started over and below is a natural look I created. Now, typically I don't use eyeshadows to line my eyes but I thought I would give it a go. It was actually easier than I thought it would be especially when using any of the last four shades on the right of the palette. Those lined my eyes beautifully and were the perfect colors to line the eyes. Although I did go back in and use a touch of the purple eyeshadow to line the top middle of my lids. Just to add a bit of drama and to make my green eyes "POP" a bit more. Now if I had to dislike or gripe about anything with this palette it would be the dual-end makeup brush that is included. I wasn't able to use it because it was rough and scratchy to my eyes. Clearly it wasn't the best quality although everything else was perfection! 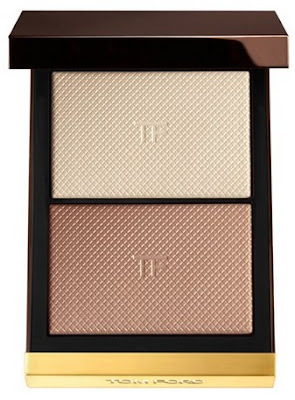 New for Fall is the Tom Ford Skin Illuminating powder duo Moodlight. The compact houses two shades: a lighter soft white shade and a warmer golden shade. The shades can be worn individually on the face or swirled together to create a multi-dimensional glow. Unfortunately I don't have a local Tom Ford counter I can visit for swatches and to purchase products. Mainly I have to rely on the internet and the occasional rogue swatches that pop up on Instagram. So when Moodlight first came available online I pre-ordered it almost immediately. Even though I wasn't sure then if either of the shades would work for my really pale skin I knew if I waited too long it would probably sell out. 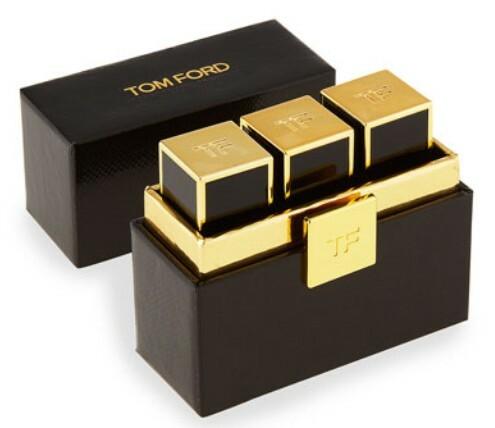 As of today it is wait list only on the Tom Ford website and several department stores have it listed as unavailable on their websites. Moodlight will probably be the "Must Have" Fall item for 2015 so I would suggest calling your local Tom Ford counter to set one aside for you. Mine should arrive within the next few days so I will try to post swatches and a quick review for you all. "Tom Ford created this highlighting and illuminating powder duo to capture the two most flattering types of natural light on the skin—a soft white shade is like the luminous glow of daylight and a radiant golden shade is like the romantic illusion of candlelight. 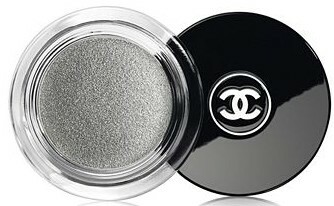 These lightly shimmering shades can be applied individually or layered together to create a multidimensional glow." New for Fall 2015 is the Tom Ford Complexion Enhancing Primer. It is both a skincare and makeup primer which hydrates and brightens the skin, reverses signs of aging, dullness and tiredness all the while minimizing pores. Sounds promising! There are two primer shades: 01 Pink Glow and 02 Peach Glow. Both shades are said to complement a wide range of skin tones and the primer can be worn alone or under foundation. I purchased the Pink Glow primer and I have been wearing it under my foundation for the past few days. I'll post a review once I finish testing it out. So far though I'm really loving it. My skin doesn't look as dry and there is a slight "glow-y" almost dewy look to my face. The new Giorgio Armani Eclipse collection features three new Eye Tints for Summer 2015. The new shades are 13, 14 and 15. Take care when placing your order though the Neiman Marcus website has the 3 shades listed as: Agathe, Bordeaux and Gold. While the Giorgio Armani website has them listed as: 13 Zenith, 14 Sunrise and 15 Sunset. Nordstrom just lists the numbers: 13, 14 and 15. If you are a fan of the eye tints then I'm sure you will love these three new shades as well. I have three shades from the original line up and I'm eager to try more; especially 15 Sunset. When I'm in a rush in the mornings I just grab an eye tint and swipe some color on my eyes then I'm good to go. It's an easy no muss - no fuss, grab and go type eye product that doesn't involve a whole lot of work. "Eye Tint is the 1st to market liquid tint for eyes. The innovative formula transforms from liquid to solid, instantly adhering to the eye lid providing 16 hours of fault-proof, smudge-free and crease-free wear. 12 luminous runway inspired shades can be used as an eye shadow or eye liner, and infinitely layered for natural to glamorous looks." 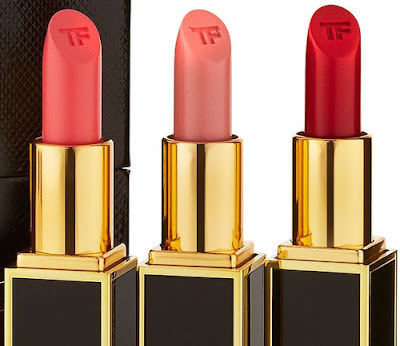 New for Fall is the Neiman Marcus exclusive Tom Ford Lips and Boys 3 piece set. 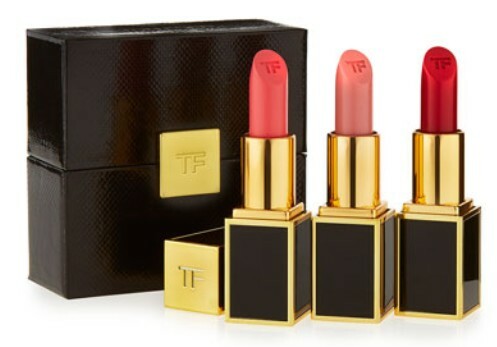 Housed in a luxe case the lip trio features lip shades in Flynn, Patrick and Luciano. All three shades are from the original Lips and Boys collection and are the clutch-size smaller version. I've heard there will be a re-launch in December of the original 50 shades with an additional 10 to 15 new shades being added to the collection. Now all this information is preliminary and subject to change so I'll update this post as more information becomes available. "This decadent wardrobe of rich lip color shades delivers maximum impact. Rare and exotic ingredients including soja seed extract, Brazilian murumuru butter and chamomilla flower oil create an ultra-creamy texture with an incredibly smooth application. Specially treated color pigments are blended to deliver pure color with just the right balance of luminosity." Includes shades: Flynn, Patrick and Luciano. Pre-order now - expected to ship on or before October 12, 2015. 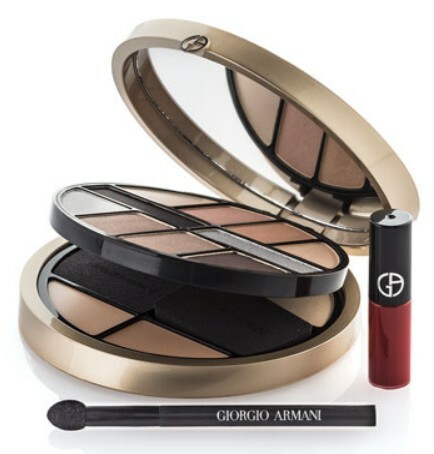 New for Fall is the Neiman Marcus Exclusive Giorgio Armani Luxe is More Palette and Pouch. This huge compact palette houses ten eyeshadows in the top layer and two highlight powders and two contouring creams in the bottom layer. Included in the compact are two eye applicators for the shadows and sponges for the powders and creams. 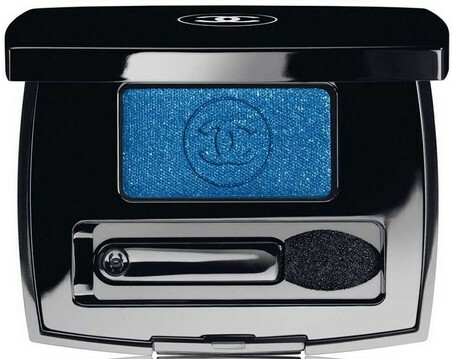 This gorgeous palette comes wrapped in a luxe velvet pouch. 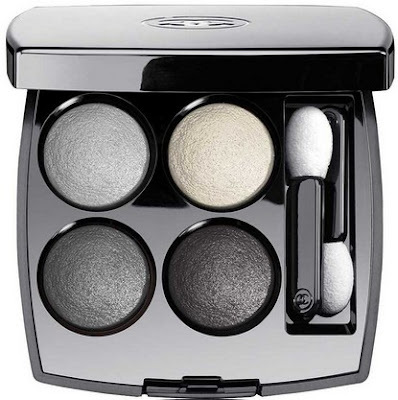 Drawing inspiration from old Hollywood glamour the 10 neutral eyeshadows in varying textures allow the wearer to create a variety of glamorous looks. Also included is a mini travel size version of the Ecstasy Lip Lacquer in shade 402. Pre-order now - expected to ship on or before October 22, 2015. Anyway, whether you are ready or not there's a whole bunch of new Fall Beauty items just waiting to keep your wallets empty! I've selected a few of my favorites below. Also, I'll post a more in-depth breakdown of each item later today so be sure to look for those posts as well. Although these three new Giorgio Armani Eye Tints are from the Summer Eclipse collection all three colors would look great for Fall. So I included them in this week's roundup of fabulous products to try.